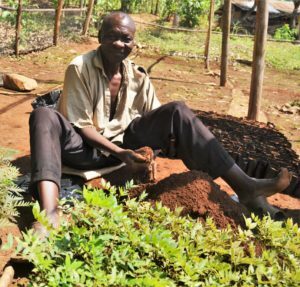 Mbale Tree Programme’s Project Coordinator, Francis Alinyo created this guest blog post highlighting the many social and environmental benefits of tree planting. Trees help tackle the impacts of climate change: excess carbon dioxide (CO2) that builds up in the atmosphere contributes to our planet’s changing climate. Trees absorb CO2, storing the carbon, removing it from the atmosphere while releasing oxygen back into the air. In one year, an acre of mature trees absorbs the same amount of CO2 as that which is produced when you drive your car 26,000 miles. 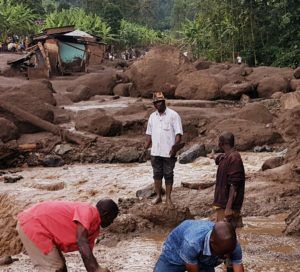 Where hilly deforested areas and rainy seasons collide landslides are always a high risk. Trees roots help secure and bind the soil reducing the risk of landslides that have been known to claim the lives of humans and livestock, as well as homes and community buildings like churches and schools. Trees have been proven to improve air quality by filtering harmful dust and pollutants such as carbon monoxide and sulfur dioxide from the air. For instance, 110 trees on average will sequester 1 tonne of CO2 a year. Reduces water runoff. This is where lots of falling or running water flows over the soil rather than being absorbed into the soil by roots. Where there is high water runoff, risk of flooding is increased. Less water runoff reduces erosion of, and pollution in waterways. On average, a mature mango tree produces between 200 – 300 fruits. Currently, the average price for one mango in Uganda is 300 shillings. 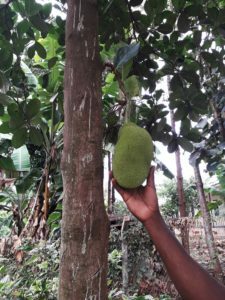 This added to other fruit trees like jackfruit, oranges, cashews, etc; and fodder trees and timber, generates good income for people. Trees placed strategically around a family home can conserve energy and cut air conditioning needs by up to 50%. By reducing the energy demand for cooling our houses, we reduce carbon dioxide and other pollutants from power plants as well as saving money. Shade from trees slows water evaporation from thirsty plants like coffee which helps improve their yield performance. 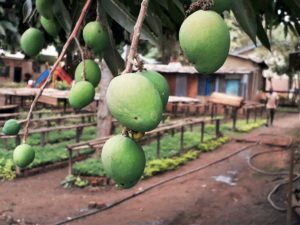 Tree food products like fruits, leaves, roots and bark provide both food and nutrition security to millions of households and their animals in the Mount Elgon region. This is more evident during hunger periods at the beginning of rainy seasons before crops are ready to harvest. Complements biodiversity which in turn increases the yield of crops. For example, tree blossoms provide a year round food supply for bees and in turn, the fertilising action of bees during their hunt for nectar can increase the yields of other crops. 96% of households in Uganda depend on wood fuel as their source of fuel. To cook food, each household needs an estimated 20.5kg of air-dried wood per day. However, fuel-wood scarcity reduces the range of food that can be eaten at home. In other areas, shortage of wood fuel is a cause of increased consumption of less nutritious, commercially processed foods. Furthermore, this demand for fuel-wood is driving a large portion of Uganda’s forest degradation. Source of wood for construction. All structures use wood in the construction process leading to its high demand. At Mbale Trees Programme (MTP) we sensitise the local community as to which trees are best for fuel-wood due to their straight growing, resprouting properties. Employment. For example, The MTP employs 55 nursery bed operators to run the 39 nurseries across the region. 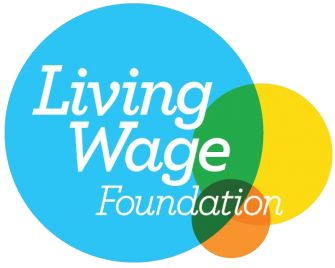 Work can also be found in processing plants or on farms. Trees and forests are the preferred habitat for many species of wild flora and fauna. Bird and animal watching and other eco-tourism activities can contribute towards a good portion of a country’s income. For communities in both rural and urban areas the shade provided by trees is a very welcome break from the heat of the sun. Tree shade allows people to avoid direct UV radiations affecting their health. Shade from trees gives the equivalent protection from ultra-violet rays as wearing SPF 10 sun lotion. Places of prayers/ancestral connections. In rural areas where material for church construction is not readily available, trees provide a good environment for people to nourish their spiritual needs. Other rituals like calling rains, making special requests as well as sacrifices are made under special trees that ritualists have a connection to. Trees screen unwanted views and dust from busy roads. Most village roads in Uganda are made of marram and during the dry periods, a lot of dust is raised by moving vehicles. This dust can cause respiratory irritation, and can also make a property dirty and contaminate food. With a good tree cover, some dust is screened, allowing people to have clean air. Trees can complement the architecture or design of buildings or entire neighborhoods. They even make homes, schools, hospitals, landscapes and other public places beautiful and habitable, especially in hot seasons. Trees mark the seasons. When trees begin flowering, farmers expect rains and when they shed their leaves, everyone understands that a dry season is still on for some time so necessary preparations can be made. This enables farmers to understand seasons for timely planting thus improved yields and food security. For instance, mangoes flower when expecting the rains and Omusasa (Sapium ellipticum) sheds all its leaves in the dry periods. Locally, specific trees like mvule, African mahogany and ficus spp are used as boundary trees to separate land of different individuals. Using trees in this way has helped resolve 80% of land dispute cases using local courts without wasting money to engage lawyers. Trees provide herbal medicine. 90% of communities in Uganda consider herbal medicine as being more effective on chronic diseases than any other drugs. For instance, jackfruit roots and bark are used as a cure for asthma, Markhamia lutea flowers and leaves used to treat ear & eye infections in children, and Carica papaya treats a wide range of ailments and issues from measels to cracks on soles of feet. In fact, at least 120 prescription drugs that are derived from rainforest plants are sold worldwide to treat cancer, malaria, diabetes, arthritis or tuberculosis. Living memorials or reminders of loved ones or to commemorate significant events in our lives. In Uganda, there is a tradition of marking an occasion, such as state functions, commissioning a completed project, opening a new school and International Women’s Day are commemorated by planting a tree. Even British colonialists are remembered for the trees they planted along roads, churches and schools. 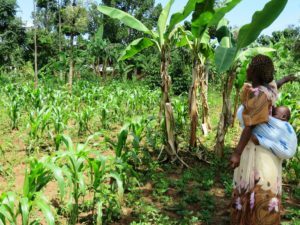 If you want to support the community in Mbale by donating to plant trees and the associated benefits outlined above visit the main project page here. What is the Mbale Trees Programme?Cardiff independent, Holy Yolks, plants 100 trees in Mbale, Uganda.